UTech, Jamaica Launches Mobile App — UTech, Ja. 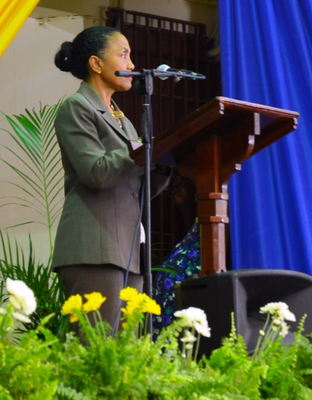 Mrs. Michelle Beckford (at podium), Corporate Communications Manager, UTech, Jamaica announcing the launch of the new UTech, Jamaica Mobile App during the University Awards Ceremony held on Friday, May 26, 2016 at the Alfred Sangster auditorium. 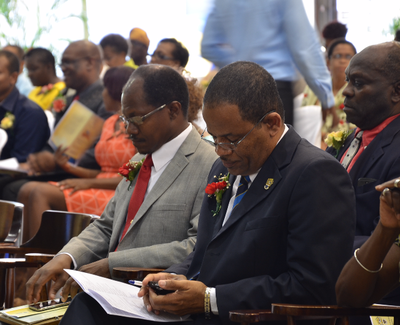 Prof. Colin Gyles (left), Acting President and Dr. Haldane Johnson, Acting Deputy President appear to be eagerly downloading the new app on their mobile phones. The Corporate Communications Unit, Advancement Division in collaboration with the Sapna group through the Office of Technology, Data Applications and Development (OTDAD), in the School of Computing and Information Technology (SCIT) has developed the UTech, Jamaica Mobile app, using cutting-edge technology to enhance communication with the University’s stakeholders. 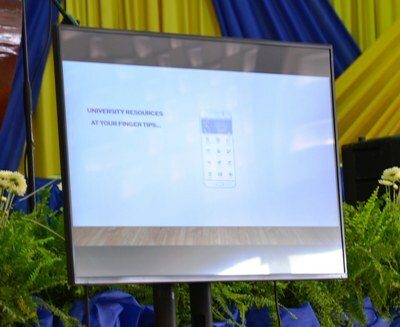 The app was launched during the 46th annual University Awards ceremony held on Friday, May 27, 2016 at the Alfred Sangster auditorium, UTech, Jamaica Papine campus. 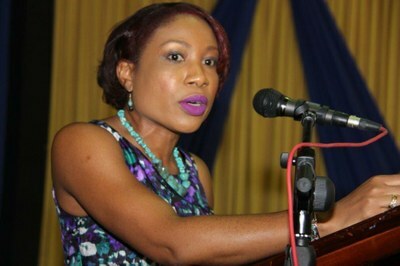 Mrs. Michelle Beckford, Corporate Communications Manager explained that, “the mobile application was developed in response to the need to use available technology and innovation to make it easier for our students, prospective students and other external stakeholders to access content on the go from their SMART mobile devices.” Mrs. Beckford further shared that the UTech, Jamaica Mobile app which is now available from the Google Play Store, consists of a suite of sub-apps which provides users with access to content on the University’s website, including Courses of Study, the Student Handbook, Moodle, News, Events, Alumni information, the Students’ Portal, Campus Map, etc. Mrs. Charmaine DeLisser, Senior Academic Director, OTDAD, SCIT in introducing the new UTech, Jamaica Mobile app shared that it is among several apps designed and built by the UTech Sapna group which consists of a cadre of SCIT students guided by competent staff in the School. 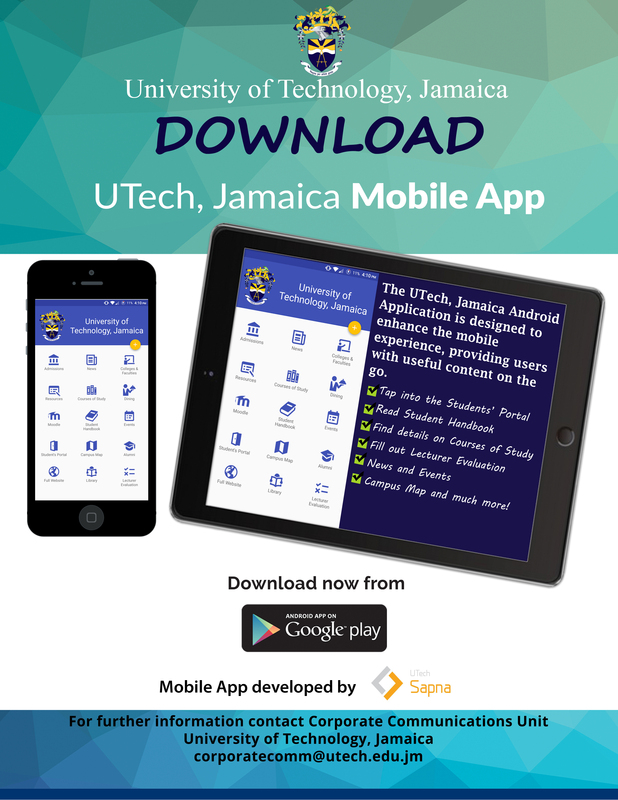 UTech Sapna recently launched the UTech Maps mobile app which provides users with directions for locations on the UTech, Jamaica Papine campus. 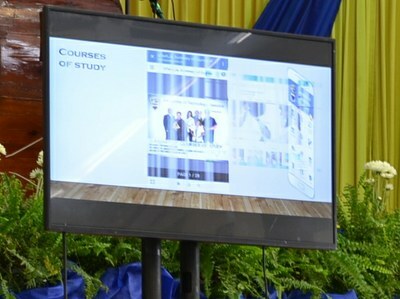 University resources now at your fingertips: Mrs. Charmaine DeLisser (at podium), Senior Academic Director, Office of Technology, Data Applications and Development (OTDAD), in the School of Computing and Information Technology (SCIT) led the multimedia demonstration highlighting features of the new UTech, Jamaica mobile app during the University Awards ceremony.